Display Smart Tags by right clicking the control and choosing Show Smart Tag from the context menu, or clicking the small rightward-pointing arrow located in the upper right corner of the control. The Smart Tags for RadAjaxPanel and RadAjaxManager are nearly identical. 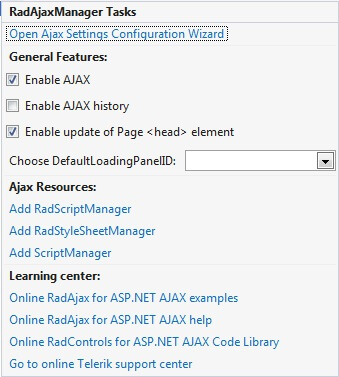 The RadAjaxManager Smart Tag differs from the RadAjaxPanel version in that it has aConfigure Ajax Manager link and a "Choose DefaultLoadingPanelID" drop down list instead of "Choose LoadingPanelID". RadAjaxPanel also has a Add RadAjaxManager option. Configure Ajax Manager: Displays theRadAjaxManager Property Builder. Enable AJAX : When this item is checked, all requests for controls managed by the RadAjaxManager are handled via AJAX. If not checked, requests are handled in the legacy postback manner. Enable AJAX History : When checked, browser history is enabled even when using AJAX. The forward and back buttons of the browser work as expected in a standard postback web site. Enable update of Page <head> element : If this option is checked, the Page <Head> element can be modified during AJAX updates. Choose DefaultLoadingPanelID : Select a LoadingPanel instance from the drop down list to display during AJAX updates. The Enable AJAX History feature currently works for Internet Explorer only. Add RadAjaxManager... :Adds a RadAjaxManager component to the form. Replace ScriptManager with RadScriptManager : Replaces the Microsoft Script Extensions ScriptManager with RadScriptManager. RadScriptManager provides enhanced capabilities for handling web resources and combining scripts for better performance. Add RadStyleSheetManager: Adds a RadStyleSheetManager to the web page. RadStyleSheetManager provides enhanced capabilities for handling web resources and combining stylesheets for better performance. Configure Ajax Manager: Displays the RadAjaxManager Property Builder.